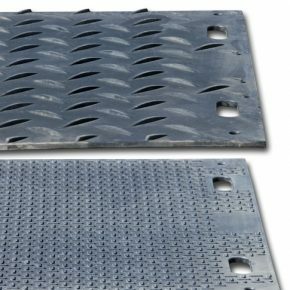 Footprint4' x 8' x 0.5"
Help prevent slips, trips and falls with Rain for Rent’s WORKSAFE® SolidGround® Traction Mats. These durable mats provide a stable surface for increased traction on muddy or sandy soil and protect landscapes from damage. The half-inch thick recycled polyethylene mats are easy to transport and simple to assemble, reducing your installation time and transportation costs. Portable landscape protection and traction. Lay them on soil, grass, sod, sand and any surface for safety and security. Prevent puncture and damage to spillguards. Skids and leveling jacks can have edges that aren’t friendly with protective spillguards. Using a SolidGround® traction mat will help prevent damage to the spillguard, saving you from possible fines. Create temporary protection for outrigger trucks and crane trucks support. Unlike plywood, our traction mats do not retain water. That means no soggy mess for you no matter how long your jobsite is active.